The virtual page-marking service is already very popular on mobile devices. 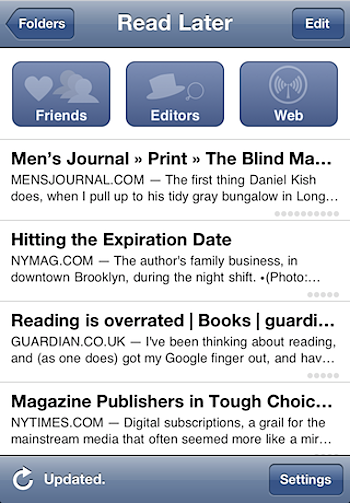 Now a user’s Instapaper “likes” are browsable by friends. Instapaper is already a very popular service on mobile devices, and it’s just had a big social sharing makeover that improves its offerings significantly. Best of all–and following current trends–a user’s Instapaper “likes” are now browsable by friends. Instapaper was dreamed up by founder Marco Arment when he realized that as he browsed the net on his mobile device he often encountered long posts that would be better perused at a later, quieter, moment–he quickly pulled the first version of Instapaper together as a way to build a “queue” of web pages that he’d earmarked for later perusal. The service took off, earning instant appeal thanks to its simplicity, ease of use, and powerful transformation of the way its users could read web content. Now it’s been refreshed into version 3.0. The latest iteration of the the app and website have sees their sharing powers significantly boosted: Users can now share their finds to Facebook, Twitter, Tumblr, Pinboard, and Evernote. The sharing is activated even if you’re using Instapaper offline (it gets actioned when you connect to the web) and user ID and preferences for sharing are synced between both web interface and app for convenience. The “likes” refresh was vital to power the biggest portion of the app’s makeover: Your liked articles can now be seen by your friends, introducing an in-app social sharing system that, while simple, is potentially a very powerful way to promote online writing. Arment notes users needn’t panic about privacy, as it’s a completely opt-in system, and it’s “tasteful.” Friends are acquired via your Twitter or Facebook pals lists, and the shared articles get prominent exposure in Instapaper’s app and website. Among the other tweaks, the new app also has a segment that lets users browse content “the best human curators on the web” have deemed to be “great”–it’s a subtle strike back at the growing content farm industry. While the core simplicity remains intact, Instapaper has added these extra features to significantly extend its utility and relevance–partly because it had to to keep pace with peers and technological developments, such as increasing tablet sales and better 3G cell coverage, including in unexpected places like metro stations.